The 1755 Battle of the Monongahela: Was it Due to George Washington’s Blunder? The Battle of the Monongahela took place on July 9, 1755, in the early part of the French and Indian War. In the battle British – and British American – forces battled against French, Canadian, and Native American forces. And the battle took place in part due to a blunder by George Washington. Bill Yates explains. 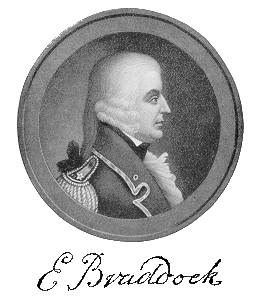 A depiction of the British general, Edward Braddock, who led British and British American forces in the battle. Major General Edward Braddock was tired. Born in 1695, in Perthshire, Scotland, he joined the military as a member of the Coldstream Guard at age 15. For 45 years he dutifully followed orders and fought for his king. Yet, on the steamy hot morning of 9 July, 1755, the immense physical and emotional strain of command wore heavily on his body (1). Just the year before he had equaled and surpassed his father’s rank when appointed Major General, and named Commander-in-Chief of all British forces in North America (1). His mission was to clean up a military mess created when a then unknown 22-year old major named George Washington attacked a French patrol. The brief skirmish ended with 13 dead Frenchmen and 21 captured. The French however claimed the men were not on a patrol but a diplomatic mission and as such considered the British action an unprovoked act of war (2/3). Concerned the French troops located at Fort Duquesne (now Pittsburgh, Pennsylvania) would retaliate Washington had a circular palisaded (wooden stake) fort hastily built. He christened it Fort Necessity, and sent word for reinforcements noting; "We might be attacked by considerable forces". By mid June, Washington’s force totaled over 400 men backed with supplies and nine small cannons or swivel guns (4). On the morning of 3 July, 1754, Washington received word a contingent of 600 French troops and 100 Native Americans were advancing on the fort. Now promoted to the rank of colonel Washington moved his men from the fort and into entrenchments he had previously dug. The ensuing pitched battle lasted to nightfall, with the British suffering far greater casualties (4). Sometime around 8 p.m. the commander of the French force, Captain Louis Coulon de Villiers, requested a truce to discuss the terms of Washington's surrender. It was one of the articles within these terms that the French used for great political gain, and may be noted as the beginnings of both the French Indian War, and the Seven Years War - wherein a clause within the signed terms proclaimed Washington was guilty of assassinating a French officer. Washington later denied the accusation stating the translation he was given was not "assassination", but instead "death of" or "killing". While the truth of the officer’s death is lost to history, the French used Washington’s signed statement as propaganda to great advantage in creating alliances against the English in the upcoming Seven Years War (4). Major General Braddock stepped on Virginia soil in February, 1755. He was accompanied by two regiments of soldiers, supplies, and an overabundance of British arrogance. Braddock displayed a disdain for the traditions, customs, and columnists themselves. His orders specifically allowed him to demand appropriations from the columnists. And, he expected little objection or resistance to his Imperial seizure of goods, supplies, and soldiers from which he took freely. It may be said Braddock looked upon the British columnists as second-class citizens, and undertook a laissez faireattitude towards American possessions. He completely failed to realize how passionately the colonists would cling to the idea of diffused sovereignty. And, to an extent he and his subordinates, through their haughty, supercilious, condescending and downright aggressive attitudes, actions and policies began to sow the seeds of discontent that would unite the Americans to come together and form a new nation twenty years later (5). It may be noted his haughty attitude was not the biggest blunder Braddock made. He chose the resource light Virginia as his launching point for a long campaign into the Ohio valley, he squandered native alliances - which he saw little use for, and he brought with him a massive baggage train with vast numbers of burdensome and resource draining followers (5). Braddock began his ill-fated trip on 29 May. He brought with him as a guide and aid Colonel George Washington and 2,200 troops. His mission was part of a four-pronged attack. He was to take Fort Duquesne and then proceed north and take Fort Niagara, establishing British control over the entire Ohio territory. He however soon encountered numerous problems. Scornful of the Native populace, he didn’t understand the need to recruit them and had only 8 Mingo guides. The road he chose was too narrow for the massive amount of people, supplies, and equipment, which meant it needed to be constantly widened so the artillery and supply wagons could transverse it. Soon, Braddock became frustrated with the lack of progress and split his troops in two. Lieutenant Colonel Thomas Gage, would lead the “flying column” of 1,300, while he remained with the slower force containing the cannons and supply wagons (5). As the remote Fort Duquesne had always been lightly manned the British believed they would be in for an easy victory. They even began to talk amongst themselves that the French would evacuate or run away when they saw the might of the British army advancing towards them. However, what the British didn’t know was that the French were anticipating such an attack and had fortified the fort with 1,600 men (5). When scouts reported the British were approaching Claude-Pierre Pecaudy de Contrecœur, the Canadian commander of the fort, dispatched 108 Troupes de la Marine, 146 Canadian militia, and 600 Native Americans led by Captain Daniel Liénard de Beaujeu to meet them (6). Here may be noted the massive error Braddock made when his disdain for the Native populace stopped him from recruiting more - as they could have advised him of the tactics which were going to be used against them. This was the hunting ground for the 600 Natives aligned with the French. Thickets, dense shrubs, and mature trees surrounded the higher ground they controlled, while the British found themselves in a lower open forest. In a short time the familiar Native hunting grounds turned into a killing field (6). Under heavy fire what was left of the flying column went into full retreat, quickly running headlong into the slower heavier force. While greatly outnumbering their attackers the British were caught off guard by their fleeing countrymen. And, the ensuing accurate shots fired by the combined French, Canadian, and Native forces sent them into a panic. The narrow road did not allow the British cannons any effectiveness and deepened the dread in the men. Seeing his troops in disarray Braddock rode forth to rally his troops. His bravery inspired the remaining British officers who stepped into the open in an effort to create defensive lines. They made themselves easy targets but the men steadied and formed together (7). The British lines began to hold, returning disciplined and deadly shots (7). As the battle ensued elements of the combined French forces circled around and attacked the wagons, and the 19-year old future American icon Daniel Boone barely escaped. A Wagoner under the command of Captain Hugh Waddell, Boone escaped by cutting his wagons and fleeing (8). Three hours into the battle a musket ball ripped through Braddock’s lung. He limply fell to the ground and was dragged away. With Braddock mortally wounded and the officer corps decimated, the British, believing they were about to be massacred, fled. The Natives refused to follow. And, instead began scalping and looting the bodies (7). This is now considered one of the British Army’s worst hours. Braddock died four days later. Of the 2,200 troops, 456 were killed and 422 were wounded. The bravery of the officer core felt the worst casualties; wherein of 86 officers, 26 were killed and 37 wounded. Conversely the French noted light casualties. The lessons learned changed the methodology of how the British would conduct future warfare (7). A side note may be referenced in that there are persistent rumors that during the retreat Braddock’s men buried a considerable treasure in the form of payment to settlers for goods and supplies and payroll for the men equaling in today’s value $750,000. While to date this has not been proven we do know Colonel Thomas Dunbar had the wagons burned, destroyed the supplies, and buried the cannons (9). French records do not show gold as spoils of the battle (7), which may lead one to believe it to be nothing more than rumor. Yet, before deciding we may also note that after the battle colonists of the area refused - and were at times forced – to provide supplies to the British. Their reasoning was they “never received payment after Braddock's accounts were lost on the Monongahela” (10). What do you think of the Battle of the Monongahela? Let us know below. (5). Anderson, F.. (2000). Crucible of War: The Seven Years' War and the Fate of Empire in British North America: 1754-1766 (New York: Alfred A. Knopf, 2000). (6). Eccles, W. J.. (1990). France in America. Michigan State Press. (7). Hadden, J.. (1906). Sketch of Thos. Fausett: The slayer of Maj. Gen. Edward Braddock, who fell in the disastrous defeat in the battle of the Monongahela in the French and Indian war, July 9, 1755. Monthly Bulletin of the Carnegie of Pittsburgh. Vol. II 1906. (8). Wallace, Paul A. W. (1 August 2007). "Daniel Boone in Pennsylvania". DIANE Publishing Inc.
(9). McLynn, Frank (2004). 1759: The Year Britain Became Master of the World. New York: Atlantic Monthly Press. (10). Hazard, ed., Colonial Records of Pennsylvania, 8:282, 85. Parsons to Weiser, 0an.] 1757, Weiser to Peters, Nov. 17, 1757, Conrad Weiser Papers 2:67, 105, HSP. Stevenson to Bouquet, 31 May, 1757,Louis Waddell et al., eds., The Papers of Henry Bouquet, 6.